The good folks at Blue Lake Citrus recently sent us a selection of their Noble Juices. The short review is that these are quality juices made by a company who obviously cares about their products. 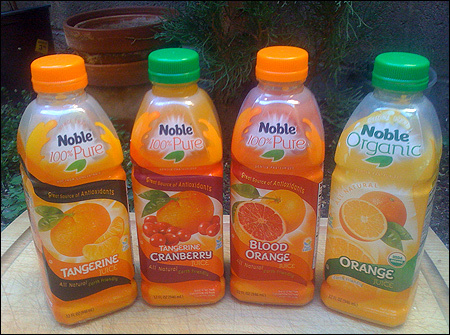 If you can only try one or two varieties of Noble Juice, make it the Blood Orange or Tangerine Cranberry variety. These juices had certain distinctions that made them especially noteworthy, while the other varieties we tried - although very good - weren't incredibly different from other name brand juices of the same type. As described by the company: "Fresh Squeezed Taste! Noble Organics work in harmony with nature by juicing fruits that are responsibly harvested from the Earth. Infuse your body with natural energy, powerful cancer fighting antioxidants and Vitamin C by enjoying a glass of our organic orange juice." My thoughts: "Okay. Nice. Tastes very fresh. Satisfying. It's not knocking me out like the fresh-squeezed stuff from the farmer's market, but... nice... tasty." As described by the company: "Busting with flavor. 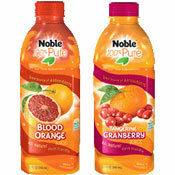 Drinking Noble 100% Pure Tangerine Juice is like biting into a sun-ripened Florida Tangerine! Our juice packs the fresh squeezed taste of tangerines, heart healthy benefits, natural energy and powerful antioxidants into one amazing juice." My thoughts: "Oh... I can really taste the tangerine here... that's a nice flavor... authentic... a tinge of tartness... I like that. I like this better than their orange juice... for sure. This is a quality juice." As described by the company: "Sicilian Delight. From its Sicilian heritage, Blood Orange Juice is an antioxidant-rich Italian citrus specialty. This gourmet fruit, celebrated for its tart and tangy flavor, delivers all the vitamins and nutrients found naturally in oranges. Live the good life, drink to your health." My thoughts: "Wow... now that's a fresh taste. Did I read the label right? 100% Pure Blood Orange Juice... yep. I'd swear there was another juice blended in... this juice has a complexity... I'm tasting the full spectrum of flavors in a blood orange... and dang it... I'm loving it. This is my favorite so far." As described by the company: "Awaken your senses. An exciting blend of two distinct flavors, tangerines and cranberries team up to deliver pure taste delight, antioxidant benefits and body boosting vitamins!" My thoughts: "Ladies and gentleman... we have a winner. This is a juice I could wake up to every day... fresh... the tastes of cranberries and tangerine play off of each other... yet it's a gentle blend... two flavors definitely meant to be together... not too tart. This juice is saying to me, 'wake up... but take your time... enjoy the morning.' The bottle says, '11 fresh tangerines and 89 cranberries squeezed into every bottle.' That pretty much describes it. Yes, this is definitely my favorite of the four." It should also be noted that these juices arrived in environmentally-friendly, biodegradable, recyclable plastic bottles which the company calls E-Bottles. For more about Noble Juices, please visit www.noblejuice.com. What do you think of Noble Citrus Juices? Noble tangerine juice is excellent. Where can it be bought in Southeast Louisiana or Southwest Mississippi? I love their juices and agree that tangerine is the best. 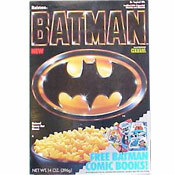 I haven't seen it on the grocery store recently though. I hope they're still making it. My favorite of all brands of juice so far!!! !